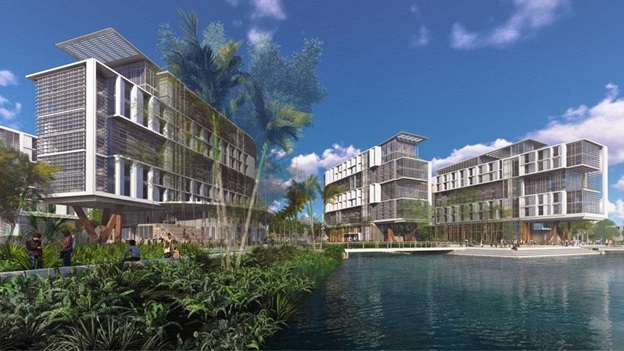 The University of Miami is preparing to begin construction a $260 million project to transform campus housing into a modern and eclectic mix of sustainable buildings. Called Centennial Village, the 522,000-sq.-ft. development feature more than 1,700 beds for first-year students, indoor and outdoor spaces for academic and extracurricular activities, a learning hub, meditation room, and apartments for faculty and staff. Design plans for the village have been submitted to the City of Coral Gables for review, and the university plans to break ground on the project in the summer of 2020. The village, which will feature four residential colleges and be built in two stages, will sit on the same site as the current Stanford and Hecht Residential Colleges and will reimagine the space fronting Lake Osceola. The first stage of Centennial Village will replace Stanford Residential College and is planned to open in the fall of 2022. The second stage, which will replace Hecht Residential College, is slated to open in fall of 2024. In addition, Eaton Residential College will be renovated and incorporated into Centennial Village upon its completion in fall of 2025. Centennial Village will incorporate facility design and innovative building systems in order to achieve LEED Gold certification, according to the university.